Secret Golf's Mike Maves visits Palm Valley Golf Club and takes a trip down the Intracoastal Waterway. [MUSIC PLAYING] FEMALE NARRATOR: On this episode of "The Rural Golfer." MAN: Now, I'm going to give you cold spray. -Now, I'm not going to be with you this week. I'm on the injured reserve. But I'm going to leave you in good hands with Mike Maves while I mend. -This is interesting because this is a part of golf that doesn't get shown. FEMALE NARRATOR: We need a champion of the everyday golfer, owner and operator of the Palm Valley Golf Club. -I wanted people that don't have the access to these fancier clubs to have a chance to learn how to play golf and enjoy the game. FEMALE NARRATOR: And take a trip down the intercostal waterway. MIKE: I'll show you the subtle differences between a blue crab and the Swiss Army lobster that's on your shirt. FEMALE NARRATOR: To give Maves a taste of the saltier side of golf. MAN: One, two, three, fore! THEME SONG: We got the big show revvin', riding around the map. Where we're going next we just can't say. Riding clubs, let's hit some balls. We're making friends and playing golf. Rural golfer's coming your way. -We got a little issue. We need to take a pit stop. I got a little toe problem. If anyone out there has ever had an in-grown toenail, I got one. And it's getting ready to kill me. So I've decided that I'm going in to get it cut out right now. MAN: OK, here's the issue. The doctor's going to put the needle in here, here, here, here. And he's going to come in here. He's going to go cut that right there and pull that out. -It's not that bad. I know it's not. But it's going to go sideways, and if it keeps going, it's-- I know it's going to keep going. MAN: You think we can just go, whack? STEVE: Pain scale. This was me four days ago. This was me two days ago. This is me, I'm somewhere right here. MAN: Now, I'm going to give you a cold spray. MAN: I usually take it right around where that bend is. -So it's this thing right here. -That big edge right there, all that thing? -That came off the side, yeah. -That's what was digging in me. You're pretty young to be a doctor. How old are you? -OK, so he covers it well. MALE NARRATOR: With Elk on the injured reserve list, friend Mike Maves seizes on the opportunity to check out Northeast Florida, one of the Sunshine State's brightest areas for golf. It's the home of the PGA tour and its famed stadium course at TPC Sawgrass. But there are countless other courses welcoming to folks from all walks of life. MIKE: I've to West Palm Beach, but I've never been quite up here, and it's interesting to see such a golf-centric area. And it's not just high end golf. I think it's interesting that we've got the whole spectrum of golf covered in one little area. MALE NARRATOR: Student of the game since childhood, Northeast Florida couldn't be a more perfect fit for a Canadian history buff building a more complete perspective of the game. -I was lucky when I started golf because I was a little kid. I was 10 or 11 when I first got exposure to what golf was about. And at the Niagara Parks Commission golf course, they had a junior membership. And my dad said to me, if you want to play golf this summer instead of getting a summer job, I'll pay for your membership if you'll use it. So I think my dad had the right idea. He got me into an environment where he knew if I was spending the day on the golf course, I was in a safe environment, and there wasn't too much trouble I could get into. MALE NARRATOR: The Golf Foundation set his life course in motion when years later, after becoming an accomplished golfer, he began giving lessons. -By screwing down, so to speak, into that focal point. MALE NARRATOR: And after posting this now famous clip about the move on YouTube, he's become an instructor to the pros. MIKE: I knew that a lot of very good golfers were looking at what I was doing because I was getting emails and calls. Sooner or later, pro's going to call. And it was Elk. -So you say just go to the most powerful position and no [INAUDIBLE]. MALE NARRATOR: Believing the past to be a precursor to the future, his passion for the game then brought him to where he is now. MIKE: Why am I interested in the history of golf? Well, I've just been involved with and interested in history. And that's what I went to school for and got my degree in. And I love golf. And when I finished my degree, it was natural for me to gravitate to history things. MALE NARRATOR: From old textbooks to historical literature of Northeast Florida's connection to the game, Maves was so drawn to the area that he made the 2,500 mile trek to come see this golf mecca firsthand. MIKE: I think finding these little places that people wouldn't immediately gravitate to is a lot of fun. MALE NARRATOR: Echoing with history, North Florida is defined by picturesque beaches, rustic charm, and many of the world's finest golf destinations. Beyond the palms lies a stretch of land renowned for its diverse golf settings, which continues to attract the game's legends and its newcomers. For more than a century, North Florida has been home to the PGA tour and home to the works of many of golf architecture's biggest names. Simply put, North Florida is comprised of some of the game's most vital elements. From the historic opening round of the 1945 Greater Jacksonville Open, the Players' Championship of today, the enduring legends of the game have graced these grounds with their presence. But North Florida is known for more than just the legends that have graced its turf and designed on it. This part of the country's charm is equally derived from the more off-the-beaten-path courses we don't see on TV or read about in the trade magazines. But that makes them no less quaint, original, and sought after. Rich in natural beauty, this area offers countless tracts of southern elegance and charm on which to play or practice. Today, these courses still inspire, entertain, and echo with a history of their very own. The dream of PGA pro Jack Hord and his wife Suzanne was a humble one, though anything but small scale. The duo dreamed of a golf course in Northeast Florida where folks could come as they were for a great round of golf without breaking the bank. So from the ground up, they built their dream. And because of them, it's today a place on which others can possibly begin building their own dream. -I always wanted a place where families could afford to play golf together, the average person. We're not your typical golf facility. I wanted people that don't have the access to these fancier clubs to have a chance to learn how to play golf and enjoy the game. Well, I played high school and college golf and then went through the PGA apprentice program and got my class A PGA card 40 years ago. SUE: When we first got married, that's all Jack had was a hammer and a screwdriver. But he wanted to build a golf course. And my thinking was it might take a little more than a hammer and a screwdriver. I prayed a lot. -We did all the work ourselves. It was a horse farm called Palm Valley Stables. -We had to take down concrete bleachers when we built this place. And they had a stable back here that housed roughly 40 horses, two stud barns. And they had fences everywhere. And so it was a lot of work just getting it ready. JACK: I really kind of got my artistic feelings out in shaping this land out here. I would build one hole, and I'd get back and look at it, and come back and say, I got to shape it a little more this way. So it was a lot of fun. It's a nine-hole layout. There's two short par fours. Even though the course is ideal for beginners and kids, we have golf pros that play out here because it is very challenging. There's a lot of water that comes into play. I would say probably number seven is our signature hole. It's got a big buffer on the right and water comes down the left side up in front. And it's a really pretty hole. I do just about everything. I mean, I run the shop. -Good. I came all the way from Texas to golf here. MALE NARRATOR: So from the ground up, they built their dream. And because of them, it's today a place in which others can possibly begin building their own. -I teach. I maintain the golf course. I mow. I do whatever has to be done. -I'm here every day. I know what a green is supposed to look like. I know what a fairway is supposed to look like. JACK: She mows, she grows, and she takes care of everything. -I know exactly how everything should be here. JACK: I hope it stays here after me and the wife are gone. I have been offered a lot of money for this place. There's more things important to me than money. This is a labor of love out here. I just couldn't bring myself to sell it at any price. MALE NARRATOR: While Mike Maves capitalized on the shade from a giant oak tree here at Palm Valley, local amateur Luke Sweeney was capitalizing on a little practice. -Let's get over here and find us some dirt. The key to this game is sameness, right? If you can get in there and do everything the same over and over and over again, then you know what's going to happen out there, what that ball is going to do. If you can find your best ball position every time, you go a long way to fixing a lot of other things. With Luke, what I was looking at is I'm going, he's got a certain randomness about how he steps up to the ball and so on. So his ball position is going to be different every time. The golf ball for iron shots is typically in the same spot. But what's happening is, if you've got it here, you widen your stance. So it's always in the same spot relative to say your left breast. And you want the bottom part of your swing with your irons to actually be a little bit ahead of the ball, right? Because you get the ball, and the divot comes after the ball. Hit a few, and when you feel a shot that went the way you wanted it to, that's when you sit there and go, OK. Let's look at that divot. Let's figure out where that ball was. And I'll bet you'll find it's right where I said it would be. -Right. You want the divot to be right here. -Forward of the ball. You got it. -Well man, I appreciate the tips. I was just fixing to go out and play. Are you busy? You free? -I got time. Let's do it. -Let's go play. OK, Luke, what do we got here, buddy? -All right. Well, you lead the way. See if I can pick up on any loose tips. -Nope, not your best. That's a little right. A little long, too. Needs a little work. So Luke, what do you do around here? -Well, it's partial fishing for me. We crab-- the Intracoastal's right over here, which is where we mostly crab, which it's actually a good area because the St. John's River is more brackish freshwater. So you can crab that certain times of year. And then the winter months, you can come over to the saltwater and still crab. So it actually works out for us pretty good. MALE NARRATOR: Just a short trip south on highway 1 from Palm Valley lies an old dirt road, and at the end of it, the Crab Shack, a rustic spot on the Intracoastal Waterway, home to a tract of family land passed down through the generations. -Growing up out here is pretty well a perfect childhood. I mean, it's just like the best playground ever. -[INAUDIBLE] swimming over there [INAUDIBLE]. LUKE: Being the oldest of the children that were around, I would round them up, and we would go what we called crabbing. Basically it was tying a chicken neck on a string and hanging it down until a crab started biting on it. We would get in a boat, throw the cast, net and catch bait and different fish. My grandparents had a small fish camp that they run. So we was helping them with the fish camp. So we was always on the water in the river. MAN: Luke has to do all the work. Of course, I guess he's [INAUDIBLE]. LUKE: I learned how to crab from my granddad, from running the fish camp. And when I was young, I would go out and help him crab, which it was totally different back then. We had small boats. You had to pull everything by hand. Wrap that in a [INAUDIBLE]. MALE NARRATOR: Despite advancements in technology, the day and life of a commercial fisherman remains respectively challenging labor of love. LUKE: Crabbing is definitely not an easy way to make a living. You're up when the tide tells you to be up. 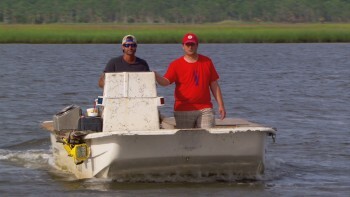 And it's more than just pulling crab traps and shaking crabs. There's a lot that goes on that people never even relate to. Your traps grow up with grass, barnacles. You got to pull them out, pressure wash them, clean them. Finding markets, keeping your crabs alive, getting the best price. You definitely can't be lazy and also be a good crabber. It's a grind, but then again, you're on the water every day. You get to see things that other people never get to see. The things I look at when I'm out here are the things that people that work indoors are the pictures they look at on their calendars. Me and the nephew have a thing, when we feel like getting competitive, and we cut us a little green area in the yard, and we'll put a crab box out there and practice chipping, see who can put the most balls on the green. All right, here we go. I make it in the box, you got to clean the crabs tonight. LUKE: Tell him who usually does, Austin. -So what brings you to these parts? -I figured I'd make a trip into Jacksonville and check out some golf courses. And I like to get out and see how people are enjoying the game where they play. I love it. You get your ball markers at the hardware store. -That's right. Whatever's easy. You don't got to worry about nobody stealing them that way. I've heard enough. -Can't seem to hit them. -On the back swing, my feet press this way. And then they reverse. So that gives me that drag, that drag feel. That I can really tune in on the flag. There's a lot more going on here than meets the eye. Looks like a very simple shot, guy walks up and hits it very close to the flag. I've got pressure in my feet pushing that way. Change, push the other way. Push that way. -Why stop here instead of, say, the stadium course up the road? -This is interesting I think because this is a part of golf that doesn't get shown. I just think that it's worth having a look into. -Right. So just to see the other side of the spectrum, so to speak. -The big side of the spectrum. -I mean, the small side is the courses that we can only dream about playing. Right? -Right. Absolutely. Yeah. Stadium course is once in a lifetime. This is twice a week. Oh, I hate this hole right behind the bunker. -A little right. Hey, I think you might have caught a corner of the green there. LUKE: A little left, but I think it's safe. But you did catch the fringe there, so that's good. I'm going to have to see if I can get one of these putts firm enough to make it. -Ugh, still didn't get her there. Oh. MIKE: Well Luke, I really appreciate you inviting me out to play a few holes here. -Yeah, absolutely. I enjoyed it. And thanks a bunch for the tips you showed me on the driving range today. I'm thinking it will help my game a little. You know, I'd like to pay back the tips you gave me on the course. If you have a little time today, how about coming out on the boat and letting me show you some crabbing? -All right. Well you know, I think I wore the right shirt, eh? -I think if you think that's a crab, you must be from Canada. You need to go with me. Most of the time, a day of crabbing is getting up early, getting everything ready, and heading out. -Going crabbing with Luke was interesting because it's just something completely new for me. LUKE: You basically just have crab traps, however much you want to fish. And you run them out, bait them up, throw them over. And then depending on how the crabs are, if there's a lot of crabs or they ain't running so well, shows you how long to leave the traps. And you just go out, pull the trap. As you're pulling it, if it looks good, shake the crabs, rebait it, put it back out. If it's not, pick it up, take it to a place where they may be catching better. So what you're looking for in these is this is your male. It's got the blue claws on the peaks. And if you look on the bottom side, he's got one sharp peak on it. And then your females, their claws will be orange on the tip. And then they'll have a more rounded abdomen. It's a lot of guessing, a lot of hoping. Especially in the summertime down here because it's so hot. It's a hustle game. Because if you take too long getting them back or leaving them in the sun, they die. And it's a delicate fish industry because they have to be alive. You can't sell dead crabs or frozen crabs. They have to be alive. So you don't have a lot of time to just sit around and enjoy being in the boat. MIKE: I learned a lot from Luke, mostly from just being with him and observing him and so on. And you get a sense, and you're reminded that you need to enjoy where you are. You can aspire to all kinds of things, but sometimes you have to sit back and go, you know what? Where I am right now is right. At least right for me. And I think he knew that. And you know, that's something that some people spend their whole lives and never figure out. FEMALE NARRATOR: On the next episode of "The Rural Golfer," with Elk still on IR, the rest of the team meets up with Maves in Florida. -Hey fellas. Welcome to Jacksonville. Good to see you. FEMALE NARRATOR: Where they discover a local course with a rich history known worldwide. -Hole number six. Hogan's Alley, we call it, where Ben Hogan made an 11 in a tournament here. -This is kind of hallowed ground here, you know. Snee, Hogan, Nelson, Demerit. Mr. Burke would have played here, the whole deal. -I think it's actually the first time that we got to play a round of golf together. I don't really like it. -Yeah, it's too high and straight. FEMALE NARRATOR: We meet a local living legend. -Even though I'm 102, I still hit the ball. It may not go far, but it's peaceful and healthy. How can you go wrong with that? You can't. FEMALE NARRATOR: And the guys get a little lost. -A little bit late to go golfing now though. FEMALE NARRATOR: When trying to find the Jacksonville Beach municipal golf course.